If you're a triathlete you'll know Dave Scott as a six time winner of the Hawaii Ironman World Champs and a legend of the sport. Dave is now a highly successful swim and triathlon coach based in Boulder Colorado, working with prominent professional and age group athletes. We've also just received a good stock of the new Finis Neptune MP3 player from Finis. We tested the new model a few weeks ago and were blown away by the sound quality. This is a brilliant player taking the old SwiMP3 model and redesigning it from scratch, including a new speaker technology which makes all the difference to sound quality and a new easy to use screen based interface. Use SOAP To Improve Your Swimming! If you're a triathlete or open water swimmer reading this blog you'll know by now that your open water skills are critical to your race performances. It doesn't matter how efficient you are in the pool if you are uncomfortable drafting or zig zag off course in open water. 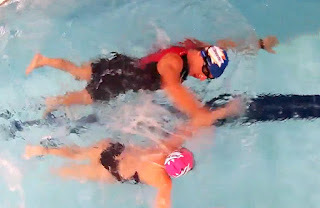 Let's look at a drill sequence developed by SS Coach Steve Casson which you can follow with a friend in the pool to help you become comfortable swimming close to other swimmers. During mass open water swim starts and when swimming around marker buoys, a bit of contact with other swimmers is inevitable. Your choices? Drop back or out to the side into clearer water - reducing your chance of catching a good draft and swimming further than you need to - or get stuck in and stay close to other swimmers getting maximum benefit from drafting. Research shows that you can save up to 38% of your energy expenditure* from drafting behind or to the side of other swimmers. A huge saving that would be insane to ignore. You might have tried swimming close to other swimmers before but found it uncomfortable (or even outright scary) to do so. Open Water SOAP is a drill sequence designed by Steve to help you gain experience swimming close to other swimmers and develop your confidence doing so. Steve is based in Northampton in the UK. Find out more about his video analysis and stroke correction services here, and his forthcoming training camps in Mallorca in July and October. In his coaching, Steve recognises the variety of challenges that stand between swimmers achieving their potential in the open water environment. Overcoming anxiety, cold water temperatures, navigating, judging distances, judging pace, wetsuit fitting, coping with choppy water conditions and learning how to gain advantage from other swimmers around you are all skills you need to experience and practise dealing with on a regular basis. The good news is that using methods such as the SOAP sequence you can develop many of those skills in the pool, just as easily as in the open water. CHATARD, J.-C., and B. WILSON. Drafting Distance in Swimming. Med. Sci. Sports Exerc., Vol. 35, No. 7, pp. 1176–1181, 2003. Have you ever counted how many strokes you take in a long distance open water event? Don't worry, neither have I, but it's a lot! At an average stroke rate of 82spm (strokes per minute) over a distance of 45.8km (28.5mi) and in a time of 7 hours and 14 minutes that equates to just under 36,000 strokes or 12,000 breaths when breathing bilaterally. The good news is that like me, you don't (and shouldn't) need to be aware of this if you're totally in the zone and focusing on the only thing that truly matters - a consistent, unwavering rhythm to your stroke. What's more, there is no magic number that will ensure your efficiency and success in an event like this - your stroke needs to be individual and work for you. 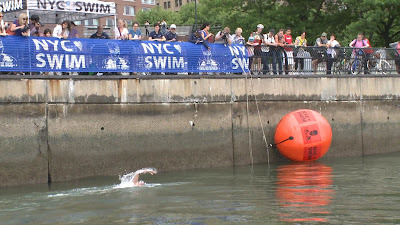 On Saturday 8th June 2013 I fulfilled a life-long goal of swimming the Manhattan Island Marathon Swimming (MIMS for short) in New York City, not only that but I managed to win the race overall from the 42 other solo swimmers selected for the event. I am thrilled to bits with this achievement and it far exceeded my wildest expectations. Now that I've had a chance to reflect and soak it all in, I wanted to share with you my story of how I got here and hopefully pass on some useful insight for your next swimming event, irrespective of distance. In the process of training for MIMS I've learnt a lot about myself and how to optimise my training program to fit around a hectic work schedule and spending time with my wife and two beautiful children under the age of five, whom without their unwavering support, none of this would be possible. It just goes to show that if you believe in yourself, your training and get the balance right in work, family and your sporting aspirations, who knows what can happen even on moderate training volumes and with a full time job and family. Good results don't happen over night, they're the result of countless hours of dedicated and consistent training of the right type and quality over a long period of time. In dedicating this win to my Grandma Rose at the prize ceremony, I realised just how long this period had been - she sadly passed away in 2003 and I've been waiting ever since to dedicate a big win in her honour, so here it is 10 years in the making! 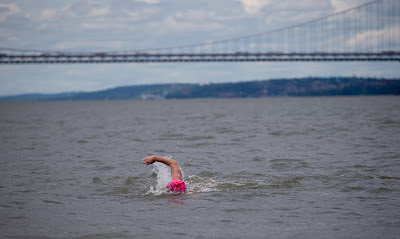 I spoke of my background in marathon swimming and of the MIMS event history in last month's Blog here: www.feelforthewater.com/2013/05/swimming-46km-manhattan-island-marathon.html so will try not to repeat what has already been said. In that blog I also mentioned what my weekly training schedule has looked like for the past 10 weeks leading into the event. I had calculated that within 10 weeks I should be able to fit in 50 sessions. These I detailed in full on my @SwimSmoothPaul twitter account on a session-by-session basis, but we've also included them here swimsmooth.com/paul-mims-training.html for your ease of viewing and interest. I tried to keep this training structure very simple and averaged 36km per week during this period, with my biggest week being 56km. My average session length was 7.2km and I performed 14 easy technique sessions of 3-4km in this period and 36 harder >8km sessions. These harder sessions were based mostly around my CSS pace (see เกมยิงปลา HappyFishingwww.swimsmooth.com/training), with even the very long 20km training swims being within 6 seconds per 100m of this pace. These were very demanding sessions, but I was always able to perform them at a very high standard because I was mentally and physically fresh enough to do so. I did virtually no speed work during this period and my weekly volume was at best only a third of 2nd place finisher Lochie Hinds from Sydney, Australia. Whilst I would have probably liked to have done more training, this was literally as much as I could fit in around my other commitments. However, what this result has shown me is that this seems to have worked out to be my optimal training load - I honestly can't envisage how I could have possibly performed any better than I did on the day. It was my perfect race. 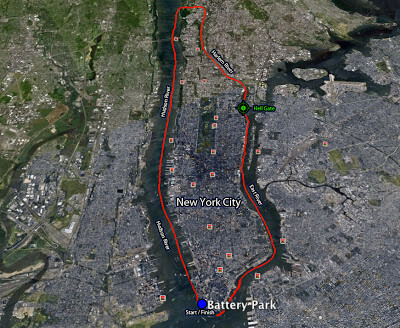 The race takes you along three major waterways: the East River, the Harlem River and the Hudson River. 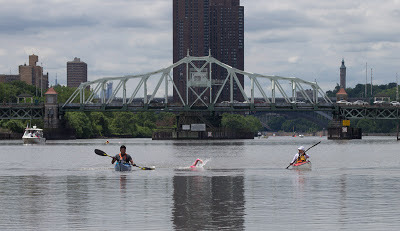 Typically you get pushed by the tide up the East River at a crazy rate of knots and find yourself passing through Hell Gate into a slowing current up the Harlem River before shooting back down the Hudson River at break-neck pace with the current. The average pace for the entire swim proved to be 57 seconds per 100m which is of course significantly faster than I could swim unassisted by current - probably 20-25 seconds per 100m quicker in fact. 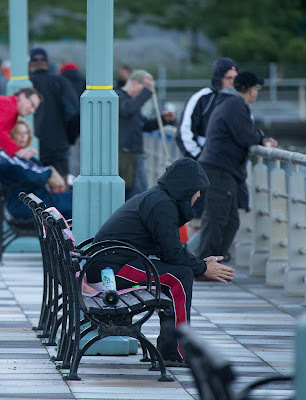 Due to a heavy rainstorm the night before the event and the after-effects of Hurricane Sandy in October 2012, many of the support boats discovered damage too soon before the event to be fixed in time. 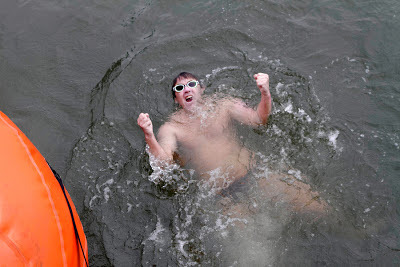 Subsequently, the race was delayed by nearly an hour which proved decisive later on when the slower swimmers came to battle the changing tide around Hell Gate. During the delay before the start, many of the competitors were getting edgy and frustrated but this is a massive sap to your energy - you have to remain positive and focused in these situations and if you do so you're already one-up on those who haven't. "Que sera, sera!" - whatever will be, will be. We were ferried from Pier 25 around to the start at Pier A in small inflatable Zodiacs, all huddled together in anticipation of the cold water that we were about to dive into. 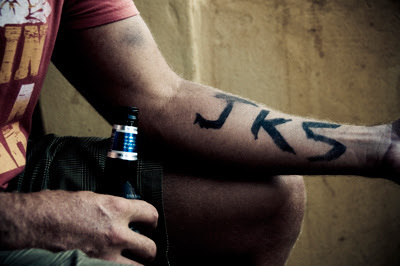 As mentioned in last month's blog, a common mantra we use in Perth for these long distance swims is "J.K.S" or Just Keep Swimming, and I noticed that one of the race favourites (Grace Van der Byl from California) had etched something similar and meaningful to her on her own forearm. Ordinarily I can get a little too anxious before these events, so I took it as a sign of me being relaxed that I realised that I still had my shopping list (Milk, Bread, Cereal) etched onto the back of my left hand as opposed to anything that might spur me on when the going got tough! We were soon in the water, starting off in the final wave of five. The water felt fresh as I dived in, but I had no doubt in my mind that I would be able to handle it - the English Channel was seemingly much colder when I swam it in 2011. I was wearing a thick layer of wool fat around my armpits, neck and kidneys which I received a little bit of mocking from the other competitors for, but it just goes to show you've got to do what works for you, not anyone else. At the start it was a little disorientating not knowing exactly where to head other than straight forwards and that your paddler would collect you within the first 200m and your support boat about 10 minutes later. I set off strongly and immediately recognised that I was alongside the three race favourites - Lochie Hinds (Australia), Grace Van der Byl (USA) and Gustavo Helguera (Argentina). I had been surprised and a tad worried to hear that I'd been seeded 4th going into the event as I was well aware of the credentials of these brilliant swimmers. Despite feeling really good, I decided to back off a bit and let them forge ahead, fearful that I might blow up later on. I was quite sure at this point that I wouldn't see them again all day. 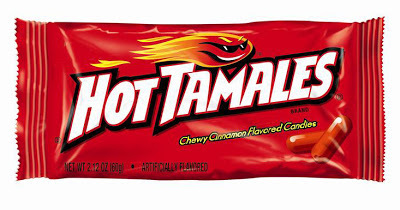 Instead I concentrated on the rhythm of my breathing and the voice of my little son Jackson telling me that I'm a "Hot Tamales" - something he always does when I tell him that I'm going for a cold swim. As we were washed round under the Brooklyn Bridge I became very aware of how quickly we were all moving, zipping by the piers like a jet boat - it was an incredible sensation. My paddlers (Amanda and Alex) picked me up without hassle and then it was head down until we caught up with Adam, Evan, Hannah and Barrie on our support boat. To help establish my rhythm, I simply kept repeating "Stroke-Stroke-Breathe" over and over again. I wasn't aware of where I was situated within the field, but I have a very distinct memory of thinking how the water appeared to be a lovely temperature and quite minty-blue in colouration - a far cry from the dirty waters that everyone had been warning me about! I focused and seemingly obsessed on this - really enjoying the water. We would stop every 30 minutes to alternate between 250ml of 32Gi Endurance drink and a GU carbohydrate gel washed down with the same drink. I wouldn't speak during these stops as I find that idle chit-chat throws off my concentration, instead I'd focus on getting my drink and fuel down as quickly as possible by flipping over onto my back and back-stroking with my left arm whilst feeding with my right. All up, these stops take less than 10 seconds to perform, thus minimising the drop-off in speed. I was feeling great - really fluid, really strong and kept reminding myself of all the hard work and sacrifices I'd put myself and my friends, family and work colleagues through to get to this point. There was no tomorrow as far as I was concerned, no more training sessions that had to be completed, it was all about the here and now. I had several tunes playing over and over in my head: Eminem's "Not Afraid" and "Lose Yourself", and bizarrely the 1980 hit "D.I.S.C.O" by Ottawan (the last song I was listening too before we started). This put a big smile on my face and gave me more rhythm to my stroke. All of a sudden I came up alongside who I recognised to be Lochie, whom I thought was well ahead of me by now. I couldn't believe it. But just as soon as I had done, Lochie took off into the distance, obviously benefiting from a different current to the one I was in. Still, it filled me with a massive amount of confidence. This was the promising young 17-year old from Sydney (half my age) who'd been tweeting about completing over 120km a week in training (three times what I had managed) leading up to this event and here I was doing a good job of keeping tabs on him two hours into the event. I was ecstatic and let out a loud "yahoo!" when I saw Evan on my boat fist pumping the air. I still had no idea though where Grace or Gustavo were or whether anyone else had sneaked up alongside me. I could see Lochie's boat hovering off in the distance, maybe 3 or 400m in front of me, but not seeming to progress any further. I couldn't bear the suspense any longer, so I shouted to Amanda between strokes "where am I?" - she obviously thought I meant where am I geographically so called back a street number which I couldn't hear very well. So I shouted again and this time she understood - she simply held up two fingers in a victory salute, "second!" at which point I bellowed out a rather naughty expletive in total disbelief and excitement and in that very moment I committed to winning the biggest event of my life. I knew the race wasn't done and dusted there at Hell Gate, certainly not with five hours to go and with somebody in Lochie's physical form chasing you down, so I just swam scared - never looking back, being quick through my feeds and putting all the tactics and skill into the hands of my team. They were amazing. Every time Evan would fist pump the air I'd shout out "yahoo!" and every time he did so I'd feel a little stronger. I fed off it like it was the very life source that was keeping me moving. We successfully navigated the Harlem River with Lochie in close pursuit. The gap had grown to 4 minutes at this stage and I still didn't know where Grace and Gustavo where but worrying about that would have not done me any favours. I had to keep going. I had to stay strong. "Concentrate, concentrate, concentrate" was all I kept saying to myself. 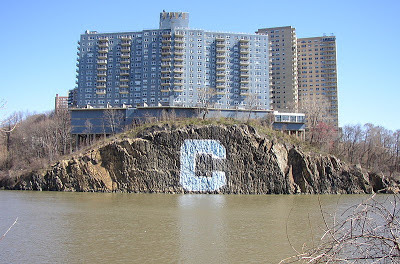 There's a big "C" for Columbia University painted onto a rock wall as you pass through Spuyten Duyvil at the northern end of Manhattan Island and from there you're almost into the mighty Hudson River. Everyone had told me how important this section was and how races have been won and lost there in the past, so I did what Evan had told me and I re-started the entire race again - I forgot everything else that had been completed thus far and readied myself for the chop and turbulence of the Hudson. I felt confident that my high stroke rate would carry me through whatever we'd encounter around the corner, the big question though was whether Lochie would start to peg me back. This scared and excited me in equal measure - the race was just about to begin! As we rounded the corner at the north-west corner of the island, I had one quick look forwards at the massive George Washington Bridge which is 1450m in length and stands 184m high and then didn't look at it again until I saw it's shadow overhead. I had been told how this humongous structure can appear within arms reach for a very long period of time and how that can easily play with your mind. Instead, I put my head down and just focused simply on not letting Lochie catch me. Like the Red Hot Chilli Peppers, we were soon "under the bridge" (sorry, couldn't resist!) and past the famous Little Red Light House, but for whatever reason I thought that we still had one final bridge to pass under. We didn't - this was the 20th and final bridge that we needed to swim below and yet we were still a long way from home. I asked Amanda how far Adam thought we had left in terms of actual time and she shouted "one hour forty minutes!" with an apologetic look on her face. Rather than thinking this was a lot, I tried to break it down into chunks: back in Perth I would cover a little over 7km in this time, or 3.5 loops of my 2km circuit in the Swan River. Whilst I was starting to feel tired and had some significant pain in my left wrist and niggles developing in both shoulders, I wasn't so tired that I feared my ability to complete it. The only concern was whether Lochie's massive training regimen would stand him in better stead for the final push to the finish than my more modest preparations. I had a brilliant team: Adam Young (team leader), Amanda Nitschke (who flew over from Australia to be my paddler), Alex (paddler provided by MIMS), Evan Morrison (who we flew over from California to help with logistics - he came 3rd in 2011 in this event), Barrie Davis (champion boat driver provided by MIMS), and Hannah Borgeson (observer provided by MIMS) - and this I class as having the biggest profound effect on my result. They were brilliant to a tee. To win MIMS was a brilliant feeling and I'd like to extend a special thanks to Morty and his team for inviting us over for their fantastic event. I am a competitive guy at heart and love the fact that this one is a race, all of us battling exactly the same conditions, whatever they might be. On the day those conditions (a lot colder than normal and tough currents) proved to play in my favour and psychologically I tried to tap into that to keep me going. A lot of people have already asked whether it was a better performance than my English Channel crossing in September 2011. The two were very different. Physically I know that I'm in a similar condition to nearly 2 years ago, if maybe a touch faster now over a 10km event. The first thing everyone asks me though about the English Channel is how long did it take me and an answer of 12h14m always feels like it needs justifying especially when that person doesn't know the conditions or hasn't seen our video here: www.youtube.com/watch?v=ZJZQ5Nlfeho. I felt like I had to really tough it out that day, both physically and mentally, and at the end of the day I did make a successful crossing when historically in the event's 138 year history only about 10% have achieved this feat. I found out later that there was an award from the English Channel Swimming Association for "The Best Swim in Worst Conditions" but that it had been awarded to the only other swimmer that made it that day. I was a bit confused about that if I'm honest having crossed 37 minutes quicker in the exact same conditions, but award or no award, at least I can say that it was recognised as the worst day that year and that's always given me personal comfort if nothing more. I realise now that marathon swimming throws many hurdles your way which can totally effect the outcome, time and result, but occasionally it throws a golden nugget your way too. It was MIMS's coldest year on record my some margin and I never thought I'd be saying that the cold would favour me, but it appears that it does. There might have been faster swimmers (on paper) in the field on Saturday but for whatever reason the effort that I put in on the day, with the stroke that I have, with my fabulous team and in the conditions I was presented with all culminated in the win, so consequently I'm very pleased about that. A special thanks once again to my absolute mentor and inspiration in marathon swimming, Shelley Taylor-Smith. Like before my English Channel swim attempt in September 2011, Shelley very kindly spent some valuable time with me going through what it might take to perform at my best around this course - one which she's personally won no less than a record breaking 5 times - that being said, I never truly believed I could win it, though Shelley had confided with Amanda Nitschke (my awesome paddler, lifelong friend and squad member) that she had an inkling that I might - she knows her stuff and clearly knows her athletes very well! 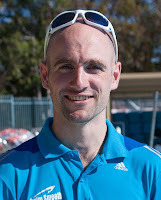 Andy coaches athletes across the complete spectrum of race distances and ability levels. Based in Cardiff, South Wales, Andy coaches individuals and currently works with a talented squad of triathletes comprised of age group champions and international athletes. He is an enthusiastic and passionate coach who prides himself on creating an environment in which the athletes strive to achieve their goals, learn from their experiences and enjoy their swimming. In 2012 Andy won the prestigious British Psychological Society Division for Sport and Exercise Psychology Outstanding Thesis of the Year, demonstrating his commitment and dedication to achieving excellence in his PhD. This diligence carries through in his squad coaching and video analysis and stroke development sessions. Whether you're looking to improve your confidence in swimming, tune up your stroke or improve your performance, he can help. Sally has had multiple successes over numerous distances of triathlon, adventure racing, open water swimming and paddling events and is very understanding of your needs as an athlete. She's passionate about coaching and is heavily involved with coaching the Swim Smooth Squads in Perth. In addition she conducts video analysis and stroke correction sessions from the Claremont Pool. She's currently training for her first 20km solo channel crossing from Perth to Rottnest Island in 2014. As with all Certified Swim Smooth coaches, Sally and Andy were hand picked from hundreds of applicants to our Three Day Coach Education Course. They have been highly trained by Paul Newsome, Adam Young and the rest of the SS home-base team to deliver all of our coaching methods directly to you in person. We're sorry if we don't have a coach near you yet. Growing the number of Swim Smooth coaches around the world is a major goal for us as a company because we know the value of high quality face to face coaching. Please bear with us while we develop this network over the coming years, carefully selecting and training coaches is critical to maintain the very highest standards of swim coaching and is not something that can be rushed. If you are interested in becoming a Swim Smooth coach, a good first step is to join our Coaches Network here. We use the network to invite coaches to join us on our Three Day Coach Education Course which we operate several times a year in different locations. From the course we select the candidates with the coaching talent and passion to go on and train with Swim Smooth to become certified by us, which takes around a year. Don't wait for Swim Smooth to come knocking on your door, get out there and start contributing to your local swimming and triathlon community to develop your skills and build your experience. You might also like to contribute on our forum too. Being proactive and passionate about coaching are key attributes we are looking for and make you much more likely to be selected. If you are interested in becoming a Swim Smooth coach, a good first step is to join our เกมยิงปลา HappyFishingCoaches Network here. We use the network to invite coaches to join us on our Three Day Coach Education Course which we operate several times a year in different locations. From the course we select the candidates with the coaching talent and passion to go on and train with Swim Smooth to become certified by us, which takes around a year. The Axena is in many respects a sister suit to the award winning men's Archimedes (as chosen by the Brownlee brothers) - a top end suit that is faster and more efficient than anything else on the market. We've been working closely with powerful triathlon world champion Caroline Steffen to develop and extensively test the suit before releasing it to you today. Many strong female athletes have excellent levels of performance on the bike and run but struggle with their body position whilst swimming, meaning their athletic potential is lost in the water. If this is you, check out the Axena, you won't believe the performance improvement you gain from the suit's unique buoyancy profile designed to pull your legs strongly up towards the surface. • X-O Skeleton for improved body alignment in the water. • Bicep release specially developed by Swim Smooth to enable a high elbow catch under the water, even as you fatigue when swimming hard. • Neoprene flexibility, thickness and stretch combination unmatched in the wetsuit market. Important note: For women who already have a high body position in the water, choose the HUUB Aura instead, it has a lower buoyancy profile that is more balanced from top to bottom. You'll find it fast and very comfortable, without creating that unbalanced and restricted feeling that most women's suits on the market give you - perfect! If you got the chance to try, how would you fair drafting on the feet of a triathlon world champion? What if you'd only learnt to swim a few years ago too? That's exactly what happened to age group triathlete Tarek when he met 2006 Triathlon World Champ Tim Don on our recent Coach Ed Course in Loughborough. Considering Tarek only learnt to swim freestyle (with Swim Smooth) in June 2009, that's fantastic swimming we're sure you'll agree! From the very beginning of his swim-life, Tarek worked with our Certified SS Coach Fiona Ford in Richmond, London. Fiona's done a fantastic job teaching him freestyle from scratch and developing his swimming, to the point now where he can sustain a fast 1:24 per 100m for 1500m. - Fiona developed a stroke technique suitable for the environment in which he wanted to swim (open water triathlon) and his height and build. Tarek's stroke isn't perfect but you'll notice from the video that he moves through the water with great purpose and rhythm to his stroke. He has a great body position, a nice catch technique and good alignment in his stroke. He doesn't fight the water at all. - From an early stage of his development, Fiona had Tarek performing training sets with a focus on CSS training. This is the perfect type of training for distance swimmers and triathletes, and has allowed Tarek to develop a strong swimming engine to sustain a great stroke technique over long distances. - Fiona worked hard on Tarek's open water skills and confidence swimming close to other swimmers, including in the pool during the harsh British winter. You'll notice from the video clip above how Tarek confidently and quickly tucked in behind Tim and was comfortable staying there. Despite Paul only giving him ten seconds warning before jumping in the water, Tarek wasn't intimidated at all as he'd practised drafting countless times before, albeit not behind a world champion! If you've read our new book you'll know that we call the three-prong approach of Technique, Fitness and OW Skills, "The Three Keys". The secret - as employed by Fiona - is to work on all three at the same time and all year round. Focusing overly on one thing (e.g. solely technique or solely fitness) will seriously hold you back, the swimmers who make the biggest gains and reach their potential in the water have a balanced all-round approach and do so consistently over a long period of time. The consistency of your swimming is extremely important, particularly when it comes to developing a strong swimming engine. Train consistently and your engine will grow but be inconsistent and miss sessions and your engine shrinks again. A classic mistake athletes make is to over-train and then blow-up, needing time off to recover. It's far better to train slightly within yourself but do so consistently for weeks and months on end, your swimming engine builds slowly but it's amazing how swim-fit you can become with consistent training. Our third lesson to take from Tarek's development is that you don't need a textbook or picture-perfect stroke to swim very quickly indeed. If you look at nearly any elite triathlete (such as Tim) or open water swimmer they don't have a super-long Ian Thorpe style of stroke with a classic high elbow recovery. That sort of stroke just isn't that effective in open water and nor does it suit every swimmer. Like all great swimmers, elite open water swimmers have a high body position, good alignment in their stroke and a great catch but they have a lot more punch and rhythm than many pure pool swimmers. This helps them move effectively through disturbed water, such as the wake created by another swimmer. If that style of stroke naturally suits you, embrace it fully and make the most of it. Don't let anyone tell you that you need to change it. And a big thanks to Tim Don for coming on our coaches course and allowing us to take a close up look at his swimming. We are going to feature our video analysis session with Tim in a future SS video production, as you can imagine Tim already has a great stroke but even he needed a small tweak here and there... Find out more about Tim on his website: www.timdon.com and twitter @trithedon. 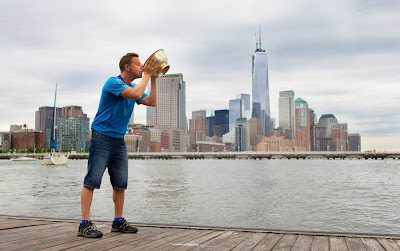 Boats & Observers Urgently Required for Manhattan Island Marathon Swim this Saturday! 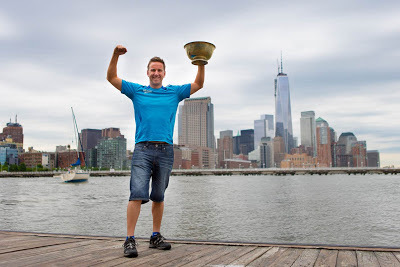 As you may have read in last week's blog, Swim Smooth's Head Coach Paul Newsome and six other swimmers from our Perth squads will attempt to swim the 46km (28.5 miles) circumference of Manhattan Island this Saturday as part of NYCSwim's annual Manhattan Island Marathon Swim. - 5 to 10 motorised support boats (and drivers) of 19-40ft equipped with VHF radios and a swim ladder. Many boats were damaged internally by Hurricane Sandy recently and this damage is only coming to light as the owners are readying the vessels for the event this weekend. All drivers will be compensated for fuel expenses during the event. - 10 to 15 observers to be aboard the motorised support boats, this will be a fantastic way to see the Big Apple and help support a world class event! If anyone can help out with these two requests, please do contact NYCSwim directly at info@nycswim.org as soon as possible - your help will be gratefully received.